I have memories from my time trading the futures' markets about prices falling hard before the arrival of "deep pockets" (whales in the Crypto sphere). We might be reaching that time with Cryptos, with traders needing to start incorporating the behavior of big institutions in their analyses. Bitcoin has not been able to break above the strong resistances that the moving averages and the bearish price action from the start of the year are providing. Bitcoin is back to the Diamond formation where it escaped from last week. This changes the scenario, taking us to a much more limited scenario, with less but much clearer options. On the downside, Bitcoin has a support from the $7854 area that extends down to the $7800 area, right where the lower sides of the Diamond formation are located. If that level is lost, expect a total new different scenario, with free room to look for new lows for the year. The first support in this new scenario is at $7400, followed by $7100, $6855 and $6600. It is not the scenario I find the most likely, but it is worth to keep it in mind. On the upside, an important level to conquer before any bullish attempt between the $8400 and the $8550. If that level is reached, we will find a very strong resistance area where the 100-SMA, the 200-SMA and the 50-EMA are trading. 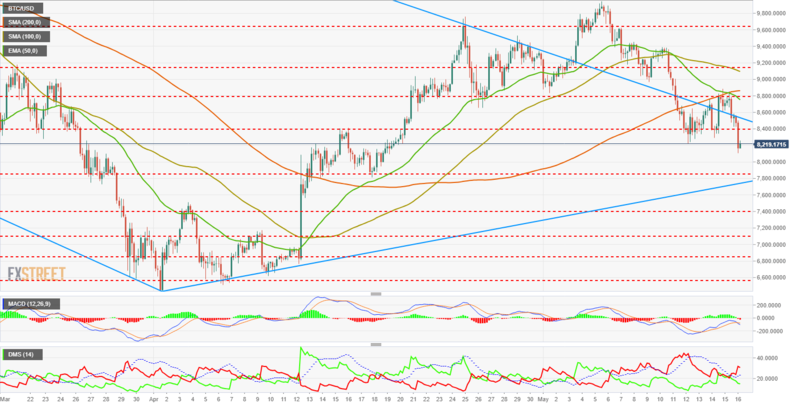 MACD in the Bitcoin 4-hour chart has crossed to the downside after reaching the middle zone of the indicator, initiating a downward trajectory of a potentially big dimension. The pattern of this tool normally doesn't extend the fall too much, but patterns don't always hold. In case of following the "normal" behavior, expect a bullish turnaround on the weekend. Directional Movement Index in the same chart shows sellers taking control and trading over the ADX, which gives confirmation to the current movement. Moreover, this one is still following the action, indicating the presence of trend strength.